Noelle Stillman is a teaching artist based in Tampa Bay, FL. 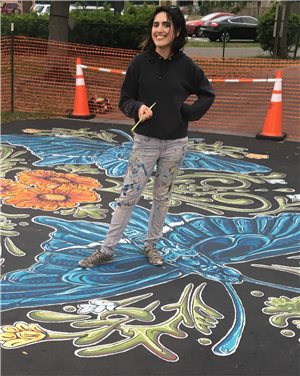 Stillman is a graduate of Plymouth State University, earning both Bachelors in Fine Arts in 2013,and Masters in Teaching in Art Education in 2014. Her teaching practice is grounded in equity, as she builds bridges between the artist community and public education by teaching visual arts within the public sector, non-government organizations, as well as out-of-classroom programs. Stillman continues to seek the paths between communities within her own artist practice through contemporary printmaking techniques. Her work has been showcased nationally. Kate Rafalski comes from Tennessee. She earned a Bachelor's Degree in Choral Music Education with a primary focus in keyboard from Carson-Newman University. Ms. Rafalski enjoys showcasing students' talents, and looks for ways to bring in community partners to expand learning opportunities. She is excited to continue growing the music branch of the Performing Arts at Sandy Lane Elementary. Tricia Harper has been dancing since the age of 2. She grew up at a dance studio in Lakeland, FL. Joined a dance company at St. Pete College-Co-Motion Dance Company. Mrs. Harper continued dancing at University of South Carolina, where she was a member of their dance company. She has been teaching for the past 26 years; the last 15 years at Jeanne Lynn Dance Studio teaching Contemporary, Jazz, Lyrical, Musical Theater Jazz, Strength and Conditioning for all the competitive level dancers, and Leaps and Turns /progressions. Mrs. Harper's favorite style to teach is lyrical and jazz. Lyrical allows you to connect your movements with the words to tell a story. Mrs. Harper enjoys choreogrphing for solos as it allows her to create to the specific strengths of that particular dancer. She loves seeing the growth of her dancers from year to year. Mrs. Harper shares the passion for dance with all students at Sandy Lane Elementary Conservatory for the Arts. Rebekah Chambers is the orchestra teacher at John Hopkins Middle School. She graduated from the University of South Florida with a degree in Music Education. Her principal instrument is violin and has been playing for 20 years and is currently a member of the Tampa Bay Symphony. Ms. Chambers has previously been a recording musician for Carl Fischer Music. 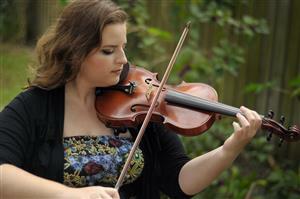 She enjoys playing for high school musicals in Pinellas County in her spare time.